– The trimmers for the USB and LSB oscillator have piggybacked two ceramic caps each. Can’t be too good for frequency stability. Or maybe they were trying to compensate by using capacitors of specific TC? – I have a distinct feeling the unit was not built with the ‘love and care’ many enthusiasts would expect from such a product. Shame, the older unit appears much better built. Chasing the bottom dollar? I do not know. I ended by moving the innards of the old unit to the new cabinet and discarding the new boards. Shame, I know… Keep the old radio if you can. poxa, sinto muito,amigo, 73, o fabricante deveria sim melhorar sempre seus produtos.! After many months of using a WFR28c wifi radio, the unit died and I had sold the 909x so I decided to do what any self certifiable person would do and buy another 909x….. Interesting tidbits on this new unit. * P-01 firmware remains. This unit goes to 76MHz on FM. Older units went to 87.5MHz. The documentation outlines that AU gets the European model. * SSB is still a problem. There is an assymetric injection of carrier between LSB and USB. Might be an alignment problem. * AM is about -1.5kHz off. This may be on purpose as it drifts when the unit warms. It is winter here so I will wait about and see what age and heat will do. I suspect this has been done on purpose to compensate for component settling. I have an inkling it will settle after a few months to be closer to what it should be. * FM performance is the best out of any unit I have owned. It is dead accurate, RDS decodes on weak signals and its pulling in distant stations like a champ! Even with AM and SSB being slightly out of whack, I am very happy with this unit. Hopefully the quality on the PCB has also been looked into! My 2.5 cents – as long as the reception is acceptable then don’t worry about the firmware. If it all works then simply enjoy it……. Thanks Avo! Indeed, that has been my intention all along. Best wishes! This post was a very interesting read. I enjoyed the observations and the comments. I’m writing here to see if anyone of you can give me accurate info. I recently acquired a pre-owned ATS-909X in mint condition. I note that the firmware version is “1.18”. After reading so many comments all over the internet about this radio’s firmware versions, I decided to email Sangean in California to learn if I could send the radio to them for a firmware upgrade. The following day, they telephoned me (!) and the fellow told me that there “was no upgrade for the ATS-909X” and that my firmware was just fine. Perhaps it is okay, but is it the latest firmware version (and the optimum version)? I have a feeling that the Sangean rep’s informaton was not accurate. What say you? Any guidance and advice would be appreciated. Thanks! My ATS-909X has v 1.29 firmware and I also notice the poor SSB performance and brownish tint in the LCD display. The AF gain has to cranked right up in order to hear SSB which gives the impression that the receiver has poor sensitivity. This is with an external antenna applied (ANT-60). In addition, the AGC seems too fast making it especially difficult to listen to SSB for any length of time. Only broadcast band listening seems to be stable – FM (excellent), MW (Good) and SW (Good). I’m wondering if Sangean made subtle changes to these radios but didn’t update the firmware revision to reflect this ? In any event, I’ve gone back to SSB listening with my ATS-909 which is rock solid in performance except for the high battery consumption. Quite disappointed with the ATS-909X. It looks the part but fails to deliver. I queried about the display and the retailer agreed for a replacement unit. We checked my current unit and the brand new in box unit and the display was even worse in the new one so I opted to stick with the one I had. It is definitely a drop in quality compared to the one I bought in August. That 1.29 unit had very good strong and stable sideband reception when using ECSS. That and a wonderful rich blue backlight with no shadow or tinting. I think Sangean is concentrating more on their DAB and WiFi units nowadays, which is quite understandable. Still, I am lying in bed in 32 degree heat listening to a remote MW station fading in and out playing 80s music and loving it. Wouldn’t want it any other way. My Pure Sensia never gets used anymore even though I used to listen to this station via web stream on it. It’s just not the same….. I am wondering if Sangean is integrating more of the functions in to the DSP chip. If so, it is possible that the SSB may be being impacted by soft muting with no way to defeat it. I also went back to the ATS-909. Much better performance. I just tuned in to the VOLMET weather report txing on USB and found the readability to be excellent. So for whatever reason, ECSS may be a little problematic but I had no problem with an actual SSB tx. As an aside, I tried a WFR28c (that had it’s own qc issues – I really think Sangean is letting quality slip whilst still charging a premium. This in itself may make me jump ship) for a few days and found the DAB reception to be excellent and FM to be surprisingly decent although not in the same stellar league as the 909x. Internet reception was a bit hit and miss. This unit seemed very picky with wifi signal quality, something I have never encountered with any other equipment. It would randomly drop connection. Still, I liked it! Very tempted to sell my 909x and go for a Tecsun S2000. What a beast. Analogue signal meter to boot! Ah, retro chic….. If eBay prices are in any respect related to value then a SP-600 that is a good candidate for restoration will cost you $400-800 depending mostly on cosmetic conditions. Recapping (as needed) and alignment will cost you more unless you DIY. Keep in mind that IF realignment of the SP-600 requires visual alignment with a spectrum analyzer with frequency sweep capability. So, if you could buy a well-maintained and perfrrming SP-600 specimen on eBay expect a cost of well over $1,000.00. One more point: A BFO is no longer a piece of hardware but just a software function embedded into the DSP. It is not surprising you have to buy another radio to get one. It is entirely possible to offer a radio with a USB port on it so you can download the latest firmware update, but no one will make any money selling the newer version. As the 909X is a hybrid unit, how much of the DSP capability is being natively used? To my understanding, the 909X still utilises discrete IF filters rather than using the software embedded in the chip. Likewise, does it do SSB in-chip? I am not aware of any Silicon Labs or Analog Devices DSP RF chipset that offers SSB. If it did, the drift I perceive in my new unit would be compensated for by the algorithm in the DSP chip. Am I correct in understanding 909x may be just an Armstrong superheterodyne radio with all the DSP functions only handling the user input buttons (user entry of band, frequency,mode,volume, tone) and output LCD display (S-meter, frequency, band other stuff displayed)? possibly some audio filtering, processing AGC etc. It would be not much more than a digital version of a Hammarlund SP 600 So the underlying benefits are portable light weight, low power consumption and possibly some audio processing function. The local oscillator would likely be digitally synthesized. It’s core benefit is the drift would be fundamentally the stability of the master crystal oscillator of the DSP and not some LC tuned circuit. So the question is what can this do that a SP600 can’t and vise versa. But that still makes it a better radio worthy of consideration! I read Avo Ohanian’s post about his new Sangean ATS-909X. This was a fascinating read. My 909X was purchased new from Amazon in the spring of 2015 and features firmware version 1.29. I have no experience with firmware version P-01 and can’t offer any help with this but experience with my 909X may help clarify some aspects about its operation and performance. I believe that there were two or three SW memory pages devoted to Russian stations factory loaded with my 909X. None were useful so I deleted them soon after acquiring the radio and reprogrammed the pages for countries and stations not provided in the default pages. I wonder if P-01 still shows all of the Russian stations? The 909X sensitivity issue is well known. MW sensitivity with the built-in ferrite rod antenna is very good. FM sensitivity with the telescopic whip is outstanding and SW sensitivity with the telescopic whip is mediocre. SW sensitivity with the supplied ANT-60 is very good. With an outdoor random wire or long wire antenna SW sensitivity is excellent. I have not chosen to do modifications to the 909X that may improve SW whip antenna performance at the possible cost of FM performance. I enjoy using external SW antennas, anyway. When going portable for traveling I use the ANT-60 for shortwave. I use battery power for all SWLing as the wall wart AC power supply does a fine job of introducing noise to all parts the SW spectrum. This probably affects MW and LW as well. LCD display. Yes, my 909X display has a slight blue tint. This hue will vary with ambient lighting and is difficult to capture accurately with digital cameras. No ribbon cable or other parts are visible through the screen, lit or unlit. Like all LCD screens, the appearance can be pretty weird if viewed through polarized lenses. This LED display is flawless, in my book. I sometimes use the 909X SSB functions for ECSS operation on SW broadcast stations. I have noticed some frequency drift if using ECSS over more than 10 minutes or so. This drift is no more than than one 40 Hz SSB fine tuning step, however. The drift can be alternately up or down in frequency. I haven’t been able to figure out if this drift is related to temperature or battery drain or both. I use Panasonic standard white Eneloop batteries in my 909x and charge them in the radio. Understand that Eneloop batteries have a nominal voltage of 1.2V and that non-rechargeable Duracell copper top alkaline batteries are 1.5V but closer to 1.7V if unused and fresh. Sensitivity of the 909X is directly related to battery charge voltage. The more voltage, the more sensitivity. This is especially evident when using battery power for SW listening. Sensitivity with new alkaline batteries is the same as running the 909X from AC power until the batteries begin to drain. With freshly charged Eneloops you are beginning with less than 1.5V volts which will drop as the battery drains. But wait, it gets more complicated… The charging system on my 909X is tiered. The charge controller will not offer the same charge profile with each charging cycle. To maintain the best SW performance with Eneloop batteries I recharge them fairly often, after about 4-5 hours of operation and before the first battery charge state bar on the LCD display goes out. Usually, this means the charge cycle (indicated by the red charging LED) lasts only 20 minutes or so and the batteries will be charged to well below 1.5V. However, if I let the radio and batteries cool and turn the 909X on and off to actuate another charge cycle the batteries will be charged on a longer cycle (up to two hours or more) and the Eneloops will be charged to close to 1.5V. I believe that these tiered charge cycles are designed to maximize NiMH battery life. The tiered charge cycles are actually controlled within the Silicon Labs DSP chip. There is a special model of this chip that includes this function and it is the chip listed in the 909X service manual. All in all, I have been very happy with my 909X. Everything still works and I use it a lot, almost daily. I often have it ready to use next to my Hammarlund SP-600 JX-21. Although the SP-600 is more sensitive and offers more versatile selectivity options on MW and SW the 909X DSP sometimes wins under noisy conditions. If I want to know what frequency I’m listening to the 909X has obvious advantages. So Avo, I hope that this information helps you in trying to figure out if changes have been made to the 909X along with the change in firmware version. I have talked to Sangean USA customer service during US West Coast business hours on other matters. He was pretty helpful. The phone number is in the operating instructions book. SW page 22 and 23 are presets named RUSSLAND if that is what you are referring to. Unfortunately the drift on my new unit is substantially more than just a 40Hz click and it is definitely heat related as I primarily use the power adapter. 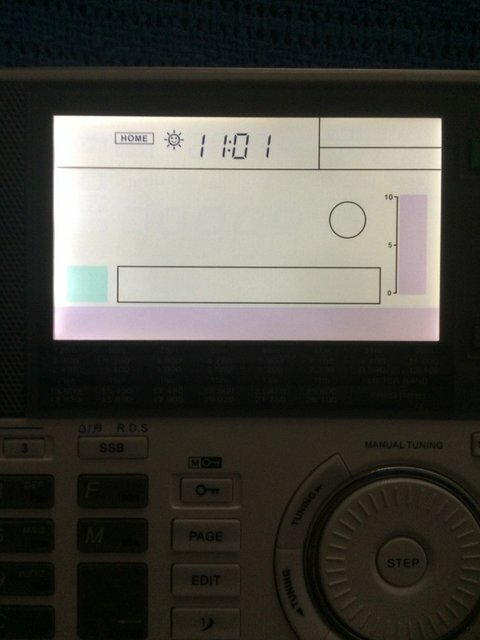 It is unfortunate that the display is not setup for 100 or 10 Hz units so I can make a call on drift range. I suspect a TCXO would be too costly for the price point. Not a huge issue as you don’t notice it in general use. On the plus side, this new unit is much better on MW using the internal ferrite rod in sensitivity. However the IF bandwidth is definitely wider. It struggles sometimes with a weak station adjacent to a powerhouse in wide mode (which of course is to be expected). There is also a prominent hiss on anything lower than a 9/10. The 1.29 unit was nevertheless much better behaved on both points. The offshoot is excellent clarity with music in wide mode. I suppose it is here that additional bandwidths would be beneficial. I want to correct one bit of misinformation I provided regarding the 909X battery charger. The charger IC is not part of the Silicon Labs Si4735-D60 GFN20 which provides complete broadcast tuner and receiver functions. The battery charge controller IC is the ON Semiconductor MC33340. Both ICs are designed and made in the USA in Texas and Arizona, respectively. I wanted to look at the circuit or dismantle radio and I found this Russian website. Just from looking at the pictures and the soldering on the circuit board looks really poor. I’m glad I found this website because now I know why this radio has issues. I don’t speak Russian but please take a look a the pictures. There is a reference to Jay Allen’s site about the firmware change as well. I own the older 909 and a newer, not sure of the firmware, 909X with the mods. I like the sound of the newer 909X, but truthfully both are a bit deaf without an external antenna. No. No BFO. Yes, 40 Hz resolution on SSB. Reception of CW on the 909X is limited by the ceramic filter IF bandwidth used for SSB and CW. This is 2.0 kHz or .5 of the bandwidth used for full dual sideband AM in the narrow IF bandpass mode. This may be too wide for for some CW fans, but OK for some not used to crowded CW conditions. I believe that it is safe to say that the 909X is not optimized for maximum CW reception. Very good point. 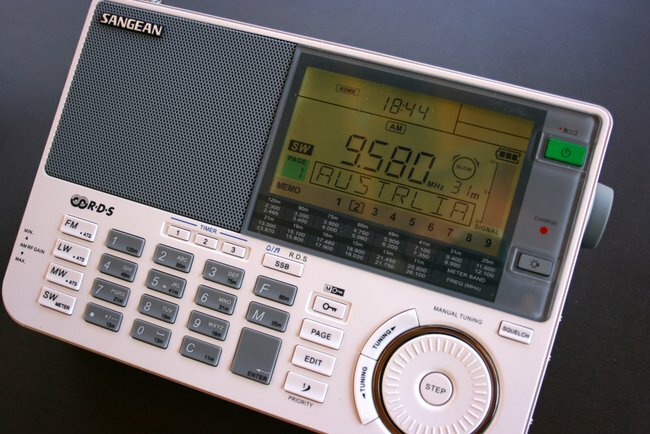 but I would buy this radio over one that cannot receive SSB/CW at the price point for this radio. A shortwave radio without a BFO function is like a motorcycle with a top speed of 35 mph. It seems that I will keep my good old Sangean 909x for many years to come. I had the same issue with the NIMH charging circuit , but after a quick troubleshooting I discovered the internal AC rectifier bridge was damaged. Changed it for a new one with 1A rate and problem is now completely forgotten . It seems that I will keep my good old Sangean 909x for many years to come. I had the same issue with the NIMH charging circuit, but after a quick troubleshooting I discovered the internal AC rectifier bridge was damaged. Changed it for a new one with 1A rate and problem is now completely forgotten.